At the forum, nominees for the CEC 22 will be permitted to make presentations to the selectors and other parents and interested parties. All PA selectors, candidates and anyone interested are strongly encouraged to attend. World’s Finest Chocolate Fundraiser @ P.S. 217 – We Did It! A sweet Parents Association fundraiser just ended last week and we extend our sincere Thank You to all of you who sold World’s Finest Chocolate bars to help our school. There are a few boxes left, so if you are still interested in boosting up your sales record, you can pick up one – as long as you pay for it on the spot. You can then take your time to sale the individual bars even after the official sale time is over. If you still have any chocolate boxes unpaid we kindly ask you to send in your payment. Payment is to be returned inside the collection envelope located inside your carry case. As soon as all the boxes are paid off we will proceed with prize distribution! 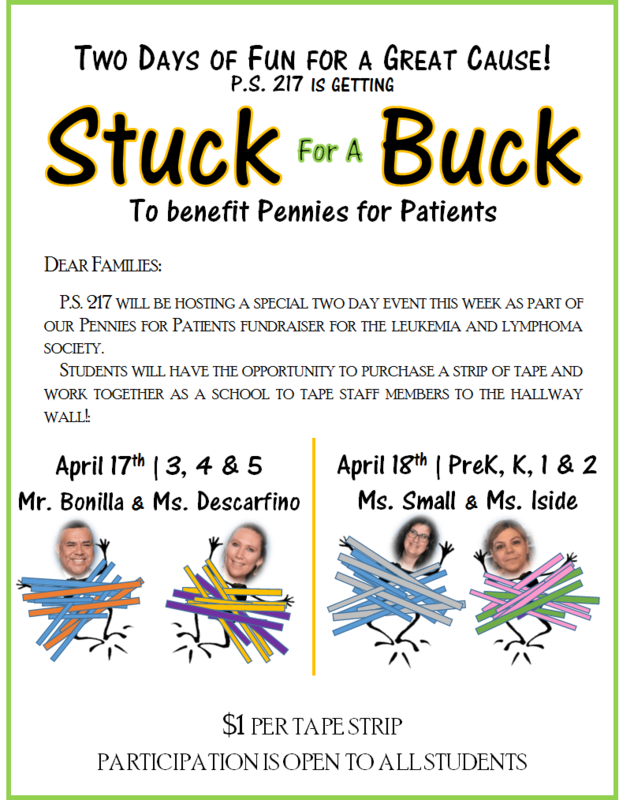 On Monday, April 8 we will be starting our second week of Pennies for Patients. We thank you for your last week’s donations and encourage you to continue supporting our cause. It is a long way until $ 5,000! Many children brought in already $5 in their coin boxes and as they returned their signed coupon, they earned the POWER RING. We are proud of them and we hope that many more students will be happy owners of such rings! Help your child fill up their individual donation box and return it to school. From pennies to quarters and even paper money, we accept them all! When your child raises $5 in the coinbox, fill out the coupon that was sent home and send it back to school with your child. In return, your child will receive a POWER RING! Create your child’s online fundraising page. Just by registering ONLINE your child gets a SQUAD TATTOO!